It’s not unusual to go to a pantomime at Christmas. If you’re going in Glasgow, it’s not unusual for that panto to star the Krankies and Michelle McManus. 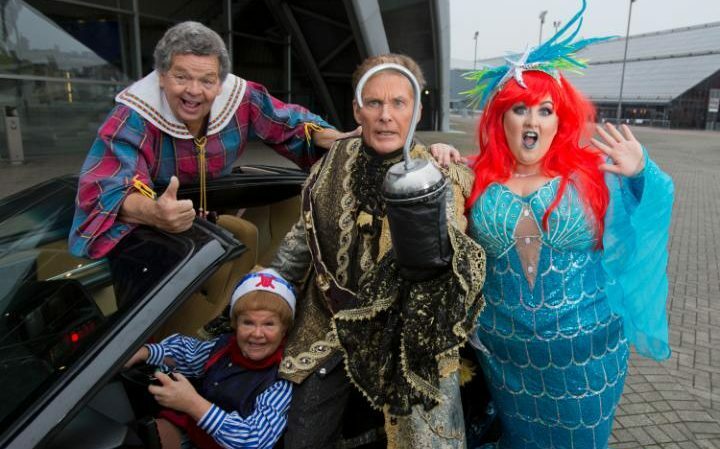 What is reasonably unusual, is for that panto to star former Baywatch babe, David Hasselhoff. And it was absolutely brilliant. It was a slow start. Peter Pan himself was not bad, but for the first five minutes of the show Tinkerbell was a laser-pointer on the wall. It relied completely on the audience already knowing the story, and it lacked the basics that most people expect from a panto – there was no “HELLO BOYS AND GIRLS!”, and the first song was an original that you couldn’t even clap along to. Some scantily-clad Native Americans did some quite good dancing. The Krankies appeared, and did some one-liners and then wondered off again. Michelle McManus dressed as a mermaid, and told bad jokes about her ex-boyfriends. So far, so average. And then Hasselhoff appeared. He was really funny. He spent the first five minutes making jokes about his name – threatening to take people’s head’s Hoff if they crossed him and other such stellar puns – and proving to the audience that he actually is quite a good singer. After that, it really took off. The singing got better. The puns got worse. By the second act there was the feeling that the cast had fallen into their stride. During a set change, the Krankies stood in front of the curtain and told some jokes. I was prepared for the bad puns – I was not prepared for the downright filth. The jokes were old, and worn out, and when told properly were absolutely hilarious – people were literally doubled over laughing. The star of the show, however, was the technology. Although we were mystified at being given 3D glasses for a live show, halfway through act two Michelle McManus announced we could explore her underwater world. The entire theatre assumed that it would be a calm, gentle ride through the sea, like Finding Nemo without the mission to find Nemo. The whole theatre was proved wrong when a little skull in a pirate bandana popped up a foot in front of their face and laughed manically. We were attacked by piranhas, by a shark, by an eel; a target appeared and everyone had to fire at a sunken ship, which returned fire so spectacularly that everybody ducked. It was stunning, and terrifying, and brilliant. The thing that everyone forgets about pantomimes is that they don’t really have any plot at all – the only reason that they bother with a story is that everyone needs a reason to be there. Pantos really just do whatever they want and damn the consequences, and that’s exactly what Peter Pan did this Christmas. It took a beloved story, and played with it so much that, by the end, it made perfect sense for David Hasselhoff to be standing in a golden and white kilt singing 500 Miles with the audience. Posted in Arts and tagged David Hasselhoff, Michelle McManus, pantomime, Peter Pan. Bookmark the permalink.